Strictly speaking the architecture of present century has already witnessed the marvels of DIGITAL ARCHITECTURE, but there will a paradigm shift in this field when we look to the future. This presentation aims at presenting those technologies that comes( or will come) under the ambit of digital architecture. In “architectural curvi-linearity”, it offers examples of new approaches to design that move away from the de-constructivism’s “logic of conflict and contradiction” to develop a “more fluid logic of connectivity.” This is manifested through folding that departs from Euclidean geometry of discrete volumes, and employs topological, “rubber-sheet” geometry of continuous curves and surfaces. In topological space, geometry is represented by parametric functions, which describe a range of possibilities. The continuous, highly curvilinear surfaces are mathematically described as NURBS – Non-Uniform Rational B-Splines. What makes NURBS curves and surfaces particularly appealing is the ability to easily control their shape by manipulating the control points, weights, and knots. NURBS make the heterogeneous and coherent forms of the topological space computationally possible. Eg: Guggenheim Bilbao by Frank Gehry. Blobs or metaballs, or isomorphic surfaces, are amorphous objects constructed as composite assemblages of mutually inflecting parametric objects with internal forces of mass and attraction. They exercise fields or regions of influence, which could be additive or subtractive. The geometry is constructed by computing a surface at which the composite field has the same intensity: isomorphic surfaces. These open up another formal universe where forms may undergo variations giving rise to new possibilities. Objects interact with each other instead of just occupying space; they become connected through a logic where the whole is always open to variation as new blobs (fields of influence) are added or new relations made, creating new possibilities. The surface boundary of the whole (the isomorphic surface) shifts or moves as fields of influence vary in their location and intensity. In that way, objects begin to operate in a dynamic rather than a static geography. Animation software is utilized as medium of form-generation. Animate design is defined by the co-presence of motion and force at the moment of formal conception. Force, as an initial condition, becomes the cause of both motion and particular inflections of a form. While motion implies movement and action, animation implies evolution of a form and its shaping forces. The repertoire of motion-based modeling techniques are keyframe animation, forward and inverse kinematics, dynamics (force fields) and particle emission. Kinematics are used in their true mechanical meaning to study the motion of an object or a hierarchical system of objects without consideration given to its mass or the forces acting on it. As motion is applied, transformation are propagated downward the hierarchy in forward kinematics, and upward through hierarchy in inverse kinematics. Port Authority Bus Terminal in NY by Greg Lynn: Dynamic simulations take into consideration the effects of forces on the motion of an object or a system of objects, especially of forces that do not originate within the system itself. Physical properties of objects, such as mass (density), elasticity, static and kinetic friction (or roughness), are defined. Forces of gravity, wind, or vortex are applied, collision detection and obstacles (deflectors) are specified, and dynamic simulation computed. Metamorphic generation of form includes several techniques such as key shape animation, deformations of the modeling space around the model using a bounding box (lattice deformation), a spline curve, or one of the coordinate system axis or planes, and path animation, which deforms an object as it moves along a selected path. In key shape animation, changes in the geometry are recorded as key frames (key shapes) and the software then computes the in-between states. In deformations of the modeling space, object shapes conform to the changes in geometry of the modeling space. In parametric design, it is the parameters of a particular design that are declared, not its shape. By assigning different values to the parameters, different objects or configurations can be created. Equations can be used to describe the relationships between objects, thus defining an associative geometry. That way, inter dependencies between objects can be established, and objects’ behavior under transformations defined. Parametric design often entails a procedural, algorithmic description of geometry. In this “algorithmic spectaculars”, i.e., algorithmic explorations of “tectonic production” using mathematica software, architects can construct mathematical models and generative procedures that are constrained by numerous variables initially unrelated to any pragmatic concerns. Each variable or process is a ‘slot’ into which an external influence can be mapped, either statically or dynamically. 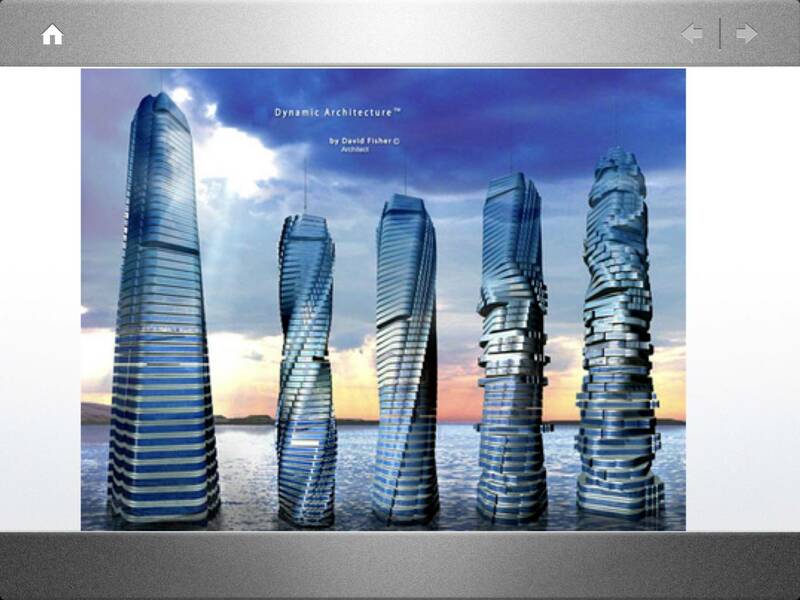 Evolutionary architecture proposes the evolutionary model of nature as the generating process for architectural form. Architectural concepts are expressed as generative rules so that their evolution and development can be accelerated and tested by the use of computer models. Concepts are described in a genetic language which produces a code script of instructions for form generation. Computer models are used to simulate the development of prototypical forms which are then evaluated on the basis of their performance in a simulated environment. Very large numbers of evolutionary steps can be generated in a short space of time and the emergent forms are often unexpected. The key concept behind evolutionary architecture is that of the genetic algorithm. The key characteristic is a “a string-like structure equivalent to the chromosomes of nature,” to which the rules of reproduction, gene crossover, and mutation is applied. Optimum solutions are obtained by small incremental changes over several generations. Born in 1951,he studied architecture at the Delft University of technology. Housing projects, exhibition spaces corporate business buildings, city planning tools, online experiences, interactive installations. With the help of new programming techniques ONL controls the complex geometry and the engineering of double-curved surfaces and the supportive construction. 1950‘s – the introduction of the computer to mainstream scientific research. 1960‘s – the introduction of graphics and visual representation by computer. 1970‘s – The large industrial acceptance of CAD in the design process. 1980‘s – Development of the home PC, and software packages. 2000‘s – First mainstream project from architects employing the full potential of CAM. CAD and CAM were developed by large-scale industry for their own use. CAD was not accepted for use in Architecture industry until 30 years after its inception. – Modeling and SCRIPT development. – Pattern, ornament, or form GENERATION. This output iks very useful for overall evaluation of the appropriateness of the design response. The output may be a PROTOTYPE which can be evaluated and used to refine the generation of the design. NOX: Interactive Architecture: Representations of diagrams, not representation of types. Automation, and commercial / cost advantages. Able to quickly manufacture very complex forms. Ability to manufacture single forms that traditionally would have been made in pieces. Ability to scale items precisely, and use scale testing. Able to produce ‚distinct‘ modular components. -Sculpture building with head, trunk and tail. -After 15 years, converted to its new function as sports centre. Since the beginning, with his involvement in “Binishells” technology, David Fisher’s design studio has developed a vision of architecture resulting from technological and economic considerations, with aesthetics being the natural output of the above. Since the first large project, “the Marriott Aruba” , Dr. Fisher has taken part in the complete process of construction, from the feasibility study, to financing, to construction management and the final commissioning of the project. For David Fisher Architecture is the space for living and the life of the people must not be conditioned by an architect’s extravagance. Infinity Design gives puts a strong focus on the flexibility of the space as life, architecture must change together with the needs of the people and the changes of the environmental conditions. 3,800 B.C. – Ancient Egyptians built the pyramids and buildings until now are based on gravity: stones/bricks/blocks are positioned one on top of the other. 1436 – Brunelleschi designed the dome of the Cathedral of Florence.The biggest dome ever built, challenging horizontal forces. 1889 – The first iron structure, the Eiffel Tower, was built in Paris . Many skyscrapers are built of bolted steel traces, based on the same technology. 1905 – Reinforced concrete was created by combining cement with iron bars; most structures until now are made of reinforced concrete. “Almost every product used today is the result of an industrial process and can be transported around the world, from cars and boats to computers and clothing. Factories are chosen for their ready access to materials, production technology, inexpensive labor, efficiency, and other conditions that result in high quality at a relatively low cost. Our building in fact are made of preassembled units, that arrive to the site completed of all finishing, equipment, plumbing and air conditioning, ready for a fast and easy installation process. So these buildings are feasible. The Suite Vollard is a futuristic residential building in Curitiba, Parana, Brazil. This building is the only one of its kind in the world, as each of the 11 apartments can rotate 360º. Each apartment can spin individually in any direction. One rotation takes a full hour. The apartment rings rotate around a static core used for building services, utilities, and all areas which require plumbing. Each apartment was sold for approximately R$ 400,000.00 ($US 300,000.00). 80 floors, 420 meters tall. First 20 floors will be Offices. Floors 36 to 70 will be Apartments. While the top 10 floors will be luxury Villas. It will be the first building in the World to be entirely constructed from factory made prefabricated parts. These parts are being manufactured in a factory in Altamura, Italy. It will require just 600 people in the assembly facility and 80 technicians on the site instead of min. 2000 workers for a similar building.•the consturction will complete by the end of this year. The losses across the envelope and the gross free gains depend on the lateral surface of the building, the type of used partitions as well as glazed surfaces on each of the facades. The shape and the dimensions of the solar protections have direct impact on the amount of the solar free gains received by the glazed areas. The vastness of the optimisation problem would itself be a problem; therefore we have defined a set of possible configurations, by combining different cases of these design variables, taken inside reasonable values. The resulting set of configurations defines the space of research of our problem. Design concerns of climate ( temperature or humidity or sunlight). Broken China mosaic is insulative and reflective surface. Broken China mosaic gives a very good textures. A passive house is a building in which a comfortable interior climatecan be maintained without active heating and cooling systems. The house heats and cools itself, hence “passive”. Passive design is design that does not require mechanical heating or cooling. Homes that are passively designed take advantage of natural energy flows to maintain thermal comfort. Reduces or eliminates heating and cooling bills. location & area : The house is near the middle of 60 acre southwest of Jacksonville , North Florida. What is the climate of north Florida? From mid-April to mid-October is generally hot and humid. Daytime temperature varies from 90 – 70 *f.
Cool nights and warm, but not hot, days, and low to moderate humidity. December and January can be cold, with several to about a dozen freezing spells. Rainfall is more uniform throughout the year in northern Florida. Cool season rainfall (meaning the 6 months from mid-October until mid-April), from 2″ to 4″ per month. Both parts of the house are very open• windows or doors on each wall for good cross-ventilation. A cupola provides a very efficient way to bring natural light inside without allowing direct radiation to enter the house. Hot water for household use is mainly provided by a solar collector. Passive solar heating in the winter. Open to the kitchen . 2500 square foot organic garden. High level openable windows capture winter sun & create cooling currents in summer.